Visit St. Pete/Clearwater caught the attention of the tourism world with its massive marketing outreach at US Travel’s Pow Wow 2012 show in Los Angeles last month, wowing tour operators and media from around the globe with a series of first-ever promotional initiatives. VSPC’s brand new, 100-foot long backlit tradeshow booth, which incorporated images and headlines from the current advertising campaign, stood as the backdrop for Visit St. Pete/Clearwater and dominated the tradeshow floor. That design was echoed in the 37 message centers located throughout the complex, each of which featured a single movie-poster-sized backlit image from the campaign. 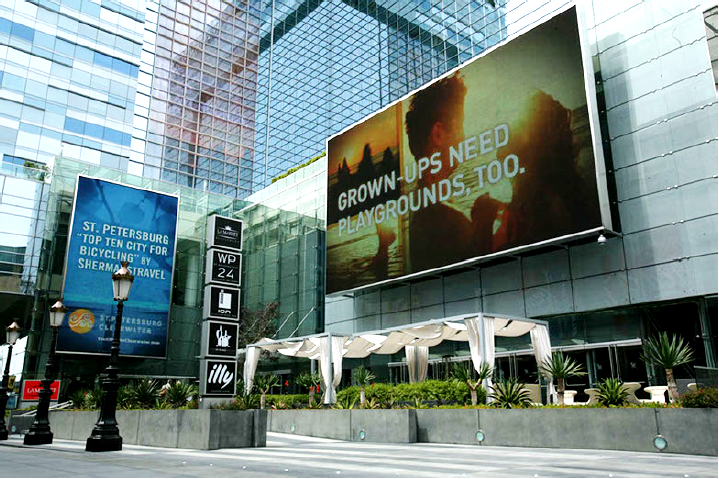 But the show-stopper of the week—which prompted comments from tourism buyers from LA to Tokyo—was the massive video installation that featured custom VSPC video montages playing on Jumbotrons throughout the LA LIVE Complex, an entertainment district adjacent to the Los Angeles Convention Center. The newly-shot videos of the area played on 17 LED screens in the Nokia Plaza and 3 massive LED screens outside the JW Marriott Hotel, the tallest of which stood 14 stories high. In addition to conducting 89 on-site meetings during the three day show, Visit St. Pete/Clearwater staff also held two receptions: a co-hosted event with The Beaches of Fort Myers & Sanibel that drew some 200 tour operators, partners and media, and a Brazilian delegation reception with Tampa Bay & Company. To see a compilation video of all of the elements at Pow Wow, click here. Visit St. Pete/Clearwater is the official destination marketing organization for Pinellas County, Florida. This entry was posted in 2012, Industry Partner News, VSPC News and tagged destination management organization, destination marketing organization, international pow wow, los angeles, marketing, public relations, tourism, travel, visit st. pete/clearwater. Bookmark the permalink. The video boards and backlit tradeshow booth were very well executed and will be of great use for some time for upcoming shows. The receptions were well attended and offered an excellent opportunity for some networking away from the tradeshow floor along with marvelous food and unforgettable entertainment. The VSPC team was, of course, exemplary although we much missed David Downing. Thanks to everyone that made 2012 International Pow Wow a howling success for our beautiful and desired destination.